First of all, you'll be dealing with Sam from JV Optical. Sam is a NYS Licensed Optician and has been serving Astoria, Steinway Street and Ditmars for over 24 years. With his experience and incredible service, highly trained caring staff, and a patient's first philosophy, you can't go wrong! Making a pair of eyeglasses is very simple and we believe in a very straight forward approach to helping patients choose the best eyeglasses for their needs. Sometimes spending a lot of money on eye glasses or contact lenses is not the key to good vision. The cornerstone of our practice is our experience and attitude. Customers have commented that "If Steinway can't help, no one can." Please call or stop by our eye care center for a free consultation of your visual needs. Feel free to ask questions and try on frames from our large selection of designer frames and sunglasses. Walk-in prescriptions are always welcome! Our in-house lab can create your custom eyewear in an hour (single vision) and most others in one to two days. Steinway Eye Care is devoted to meeting the needs of all our patients, young and not so young, new patients and old friends. We understand that educating our patients on eyecare and eyewear will work to ensure complete satisfaction. We offer cheap eye services to all patients coming from Woodside, Jackson Heights, and the entireQueens, NY area. Queens optometrists provide a comprehensive eye exam and a full range of professional services includingLASIK co-management and treatment of eye infection. We accept many forms of "Optical Insurance" and Medical insurance. If you need an eye doctor in Astoria, our optometrist team on Steinway Street is only a short drive away. We love walk-ins from all around the areas of Ditmars, Jackson Heights, and Queens NY. Dilation is completed as required. Our friendly optometric staff is qualified to treat "pink eye" and many other types of infections. We offer one hour or next day services for eyeglasses in emergency cases where contact lenses are no longer an option. Our friendly eye exam staff will meet your vision health needs at your next eye exam. 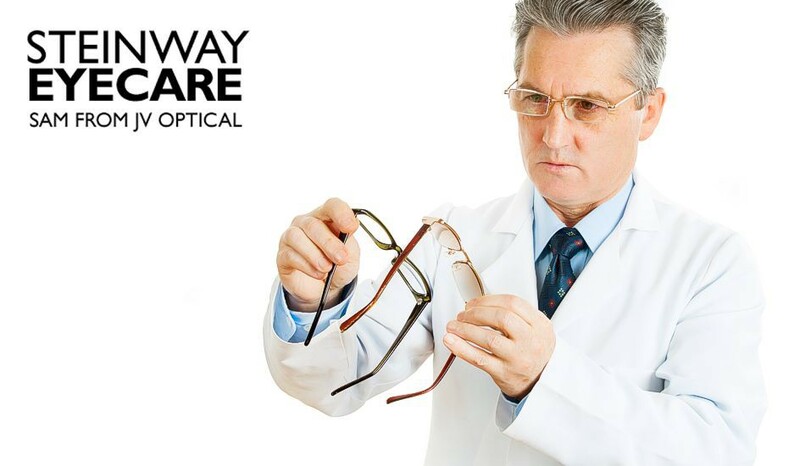 The optician team at Steinway Eye Care is focused on serving you. After your comprehensive eye exam at our optical on Steinway Street in Astoria, a certified optician will help you select the best eye glasses or contact lenses for your specific eye care needs. We carry a huge selection of eyewear, including eye glasses and contact lenses right here on Steinway Street! Sam has been a New York State Licensed Optician for 30 years. A rarity among opticians Sam is also licensed to work with contact lenses and specializes in gas permeable lenses. Sam constantly takes continuing education classes to keep up with the latest technology in optical lenses and eyeglasses. No matter what questions or visual need you may have, Sam will be able to help you pick the best glasses for you. Progressive lenses, digital progressive lenses, thick lenses or thin lenses Sam has help thousand of adults and children. Sam has been recognized countless time for the service and quality he provides. He has been featured by http://mommypoppins.com/newyorkcitykids/nyc-kids-eyeglasses-eyewear-childrens-glasses for his attentive service with children. Cynthis has been working with Sam for more then 10 years. Not only can Cynthia help you with your glasses, Cynthina is an expert in navigating your vision insurance or union information. Cynthia will be sure to get the maximun allowed contribution from your plan. Call Cynthia today to schedule you next eye exam at Steinway Eye Care in Astoria. Maria has been helping people with their eyeglasses since she was 15 years old. Choosing the newest designer frame style for your face is Maria's specialty. If you are looking for that funky kind of a look or even if you want your glasses to disapear when you wear them, Maria will take the time to show you the latest eyewear fashion trends available. And at Steinway Eye Care we stay up on the eyewear fashion and have a huge selection.